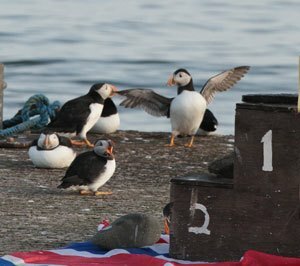 Coquet Island’s puffins celebrated the Jubilee and the Olympics with their very own “Jubilympics”!! This year the need to reinforce the protection of the roseate terns meant that the RSPB in conjunction with Natural England have restricted boat traffic entering the quay area on Coquet Island because in so doing, it was disturbing the roseate terns. The penalty for such disturbance is a max of £20,000 and confiscation of any vessel involved. We wanted to keep the charter boats on the right side of the law so a new sign was erected at the head of the jetty to explain to skippers and passengers why everyone is needed to help. 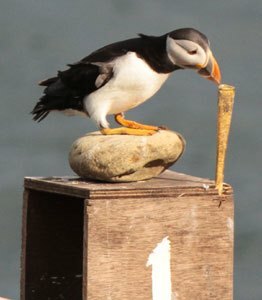 With the jetty more quiet, the puffins started using the jetty as new roost, along with tens and other birds.